The Norwegian government is joining California’s battle against the climate policies of US President Donald Trump. While Trump wants to pull the US out of the UN’s landmark agreement in Paris to cut carbon emissions, California is intent on meeting or exceeding goals or emission cuts, and Norway can help the huge state electrify transport. “We need partners to limit emissions, and Norway is a very good partner with whom we’d like to have a formal cooperation,” Matt Rodriguez, head of the California Environmental Protection Agency, told Norwegian Broadcasting (NRK). 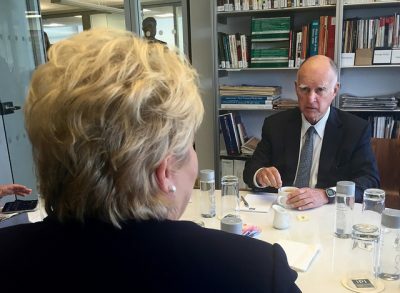 Rodriguez, appointed by California Governor Jerry Brown, met in California’s capital of Sacramento on Wednesday with Norway’s climate and environment minister Vidar Helgesen. The two signed a cooperation agreement aimed at moving forward with programs for emission cuts despite Trump’s intention to reject them. California already has similar agreements with other countries including Canada, and hopes Norway can now help it “strengthen programs for electric cars.” Even though Norway continues to controversially generate emissions of its own through its major oil and gas industry, the country has provided incentives for electric cars for years that have made it a world leader in electric car use. Helgesen said he was impressed by “how hard business and governement here (in California) are working to bring down emissions.” Since California’s economy would rank as the world’s sixth largest if it were its own country, Helgesen noted that its impact on climate policy and global emissions can’t be over-estimated. “I see great opportunities for Norwegian authorities and companies with this agreement,” Helgesen told NRK. It calls for California and Norway to exchange information and experience regarding methods and goals for emissions cuts, especially within the areas of renewable energy and reduced emissions from the transport sector.